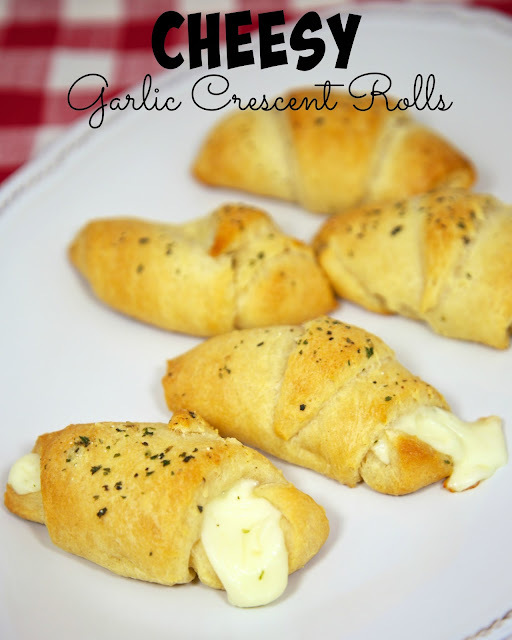 Cheesy Garlic Crescent Rolls Recipe - string cheese, butter, garlic seasoning and refrigerated crescent rolls - great with pasta or as an appetizer served with warm pasta sauce. Super quick recipe! 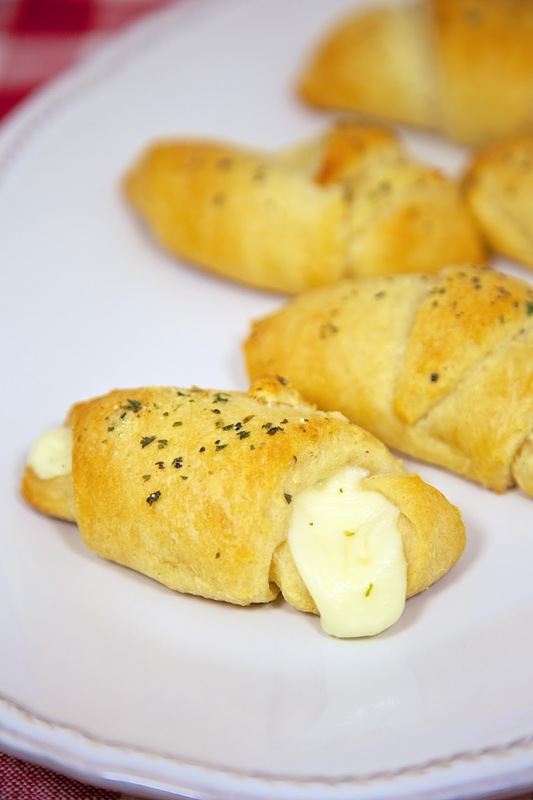 Cheesy Garlic Crescent Rolls - string cheese, butter, garlic seasoning and refrigerated crescent rolls - great with pasta or as an appetizer served with warm pasta sauce. Super quick recipe! We served these Cheesy Garlic Crescent Rolls with the Chicken Parmesan Stuffed Shells that I posted yesterday. They are, in a word, delicious! I could totally make a meal out of them with a side of warm spaghetti sauce. These rolls only have a couple of ingredients and can cook along side of the pasta casserole. I used light string cheese and it worked just fine. We've made these a few times and can't seem to get our fix of them. Combine melted butter and garlic bread seasoning. Set aside. Separate crescent dough into 8 rolls. Cut string cheese in half. Brush half of the butter on top of crescent rolls. Place one half of string cheese on the long end of each crescent roll. Roll up and place on baking sheet. Brush rolls with remaining butter. Bake for 15-18 minutes, until rolls are golden brown. Yum!! This WILL be on our table tonight!! Thank you for all of the great and easy recipes! My mouth is totally watering now. I'm such a garlic freak and I will be giving these a try. War Eagle! I've made these & they are excellent! I made these last night and they are amazing! I didn't have specific garlic bread seasoning so I mixed garlic powder, italian seasoning, grated parm and S&P into the butter. Delicious! These will be a regular for us. Thanks for sharing!